Both Breville Big Squeeze and Kuvings Whole Slow Juicer are slow juicers that help in extracting juices from all types of produce. They use a screw and a filter design that helps in juicing any produce to its maximum and leaves a rich, healthy taste behind. They both are sleek and are designed to save countertop space. Big Squeeze ensures that the output is a little thicker, smoother in texture and filled with nutrients and fiber. It apparently works the best for items such as wheatgrass, small berries, and tomatoes. The Kuvings system comes with three different filters that help in making juice, smoothie, or ice cream. 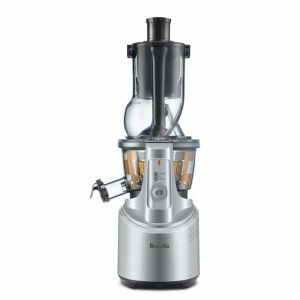 These two juicers, Breville Big Squeeze and Kuvings Whole Slow Juicer have the same screw and filter masticating technology that allows users to achieve maximum output from the juice. While the Big Squeeze leaves a little thick texture behind while Kuvings allows users to switch between a pure juice, a smoothie, and an ice cream. They both have a Smart Cap that helps in creating mixed juices and stops dripping. Big Squeeze comes with a spout plug that allows users to pre-mix the juice for achieving a fuller flavor. Its Juice jug is made using high-quality Tritan, the filter mesh is of stainless steel material, and the rest of it is molded from ABS Housing. The parts have red dot indications to help users assemble and disassemble them with ease. The Kuvings juicer is capable of squeezing juice from nut milk and frozen fruit desserts as well with the help of their patented JMCS squeezing technology. The three different strainers are made available for easy switching between various outputs. It comes with a hopper attachment that catches smaller items. While screw is made using BPA-Free Ultem material the rest of its body is crafted from Tritan and ABS material. 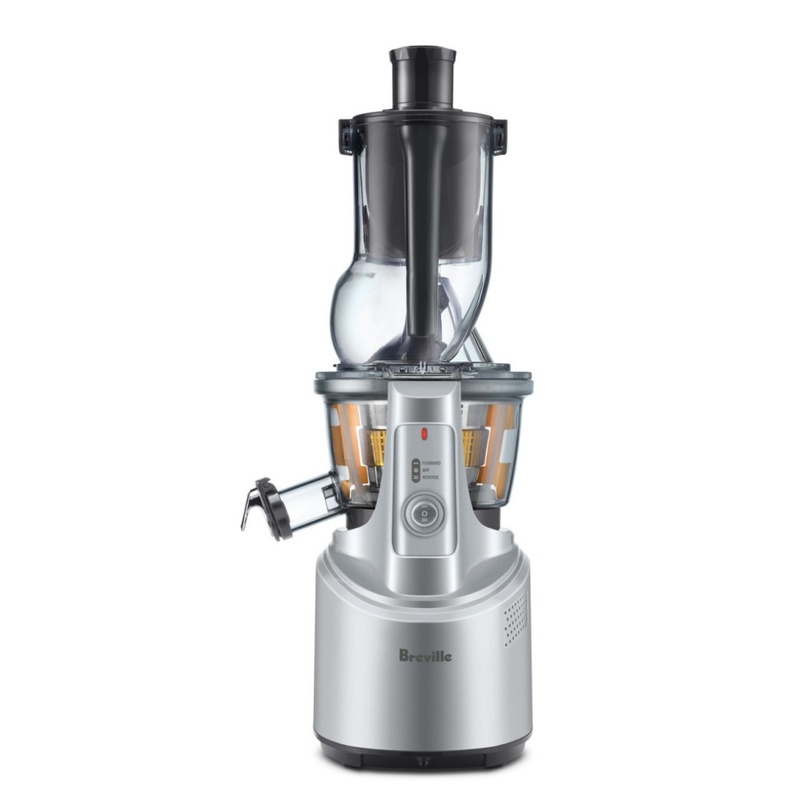 Both of these low-speed masticating juicers use a vertical input system that juices the produce at 80 and 60 RPMs respectively. Both Breville Big Squeeze and Kuvings Whole Slow Juicer have a large 3-inch chute that allows users to insert full produce for quick and convenient juicing. These juicers come with a powerful 240 Watt motor that helps in juicing the toughest of produce with ease and speed. The motors are built specifically to rotate slowly with a deceleration feature and they generate very little noise and vibrations while juicing. Breville Big Squeeze comes with forward and reverse Directional Control for juicing and unclogging. There is no information available regarding Kuvings Whole Slow Juicer. All the parts of these both Breville Big Squeeze and Kuvings Whole Slow Juicer are easy to disassemble and assemble. They can be washed and rinsed easily with the help of water. Breville has a Quick Rinse Technology that fills up the mixing bowl and completely rinses the machine out in-between juices. 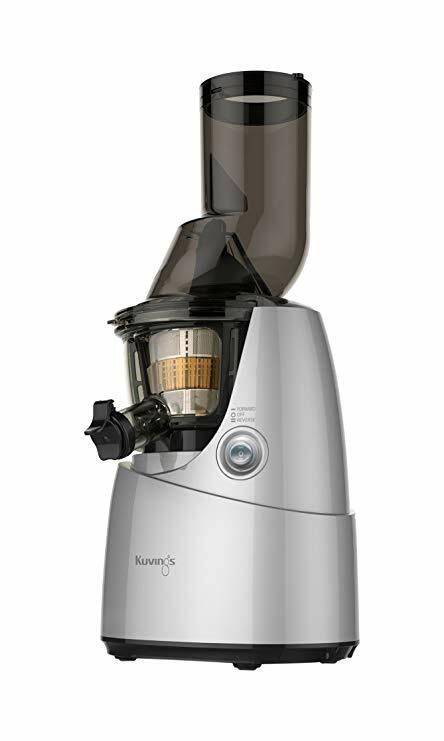 Kuvings lets users clean up trace residue in the juice strainer with a simple motion of putting the rotating cleaning brush and the strainer together and twisting them against each other. Both, Breville Big Squeeze and Kuvings Whole Slow Juicer offer a 10-year limited warranty to users. Overall, Breville Big Squeeze performs the juicing pretty well and is much better at generating juices over the centrifugal type juicers. Its wide chute is helpful in reducing prep work and there are no lumps left behind after juicing is performed. The cleaning mechanism is also very helpful and the operation is pretty quiet. One of the disadvantages of this juicer is that it is not made out of metal parts, which makes it difficult to juice tougher produce. It has been noticed that it gets blocked easily and there is some un-juiced fruit parts leftover inside the container. Kuvings Whole Slow Juicer is well-received by the customers and has been applauded for its juicing abilities. It is sleek enough and saves a lot of counter space without compensating on the quality. The juices, smoothies, and ice creams taste really good and the system is pretty easy to clean. The juicer gets heated up and requires cool down for a couple of minutes before reuse. The juicer doesn’t lock into place with the motor and has a slight giggle to it. Few users have found it to be a little difficult to clean over a horizontal auger or juicer. Be the first to comment on "Breville Big Squeeze vs Kuvings Whole Slow Juicer"